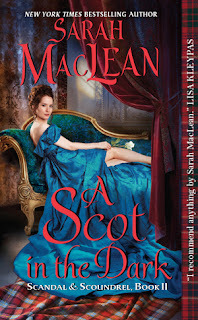 Let's just start by acknowledging that I am woefully behind on reviewing the Sarah MacLean books I have read and loved, which is to say all of them. The thing is, I am simply not overstating things when I say that reading Nine Rules to Break When Romancing a Rake changed my life. And it is a truth universally acknowledged that both A Rogue by Any Other Name and One Girl Earl Deserves a Lover hold pivotal places of honor on my Beloved Bookshelf. As such, I'm beginning to think that her books are so important to me that when it comes to articulating precisely why, I can run into a bit of a struggle. But. I am going to attempt to begin to rectify the situation by reviewing her latest novel and the second installment in the wonderful Scandal & Scoundrel series. I reread the first book in the series in preparation for the sequel, and I am happy to report it was just as delightful the second time around. Lillian Hargrove's world has just been shattered, and by the one person she trusted the most. On top of that, when the man she loves chooses to ruin her, he does it on the most public of stages and on the most epic of scales—as he is about to reveal his latest masterwork, of which she is the subject. While she was a willing model for the painting, she in no way gave consent to it being shared with the entire population of London. Fully cognizant of the enormity of her mistake, Lily retires to the town home where she lives alone and begins preparations to leave London (and her scandal) behind for good. What she does not count on is her latest guardian swooping down from Scotland, determined to marry her off yesterday and rid himself of the unwanted burden she embodies. Alec, Duke of Warnick, never wanted any of the nonsense he's inherited along with his dratted title, least of all a troublesome ward who seems bent on self-destruction. Once he sees her, he deems it only a matter of days before he is able to marry her off and be on his way back to Scotland. What he doesn't count on is Lily herself and just how magnificently she will change the course of his life. "Shall we discuss the scandal?" Her cheeks burned. She didn't like it. "Is there a scandal?" He turned to look at her. "You tell me." "Well, I imagine the news that you broke down the door in broad daylight will get around." Something flashed in his eyes. Something like amusement. She didn't like that, either. "Is it true, lass?" And, in that moment, in the four, simple words, spoken in his rolling Scottish brogue, warm and rough and almost kinder than she could bear, she wished herself anywhere but there. Because it was the first time anyone had asked the question. And it was the millionth time that she'd wished the answer were different. The way she handles herself alongside the imposing Scot, set against the truths we glean from her inner dialogue, is why I immediately found Lillian endearing. And we gain enough insight into her less-than-charmed upbringing to understand a little of why she makes the mistake she did and to fully admire (once more, along with Alec) the intelligent and organic way that she conducts and asserts herself throughout the ensuing ordeal. Fortunately, she is helped along the way by a few fellow scandalous (and gleefully familiar) faces. Each of the glorious Talbot sisters make their entrances, and they prove to be even more witty and outrageous than in the previous volume. I could do nothing but cheer silently as they surrounded Lily with their patent (and I suspect, hard-won) unconcern for the ton's censure. And I look forward meeting them again in forthcoming tales. There was a long moment of silence before he changed the subject. "Which one owned this odious place?" She didn't hesitate. "Number Thirteen." "Ah. The one killed by a sheep, allegedly." "What happened to him, really?" She blinked. "That is what happened to him. He was killed by a sheep." His brow furrowed. "You are joking." "I am not. He fell off a cliff." "The sheep. The duke was out for his daily constitutional. Below." She clapped her hands together. "Quite smashed." She raised one hand. "I swear it is true." And on they roll. Alec and Lily's story is a quieter and more contained affair, in many ways, than Sophie and King's. Their movement and growth is more internal, as they wrestle with issues of shame, privacy, gender standards, and intrinsic self worth. My one complaint was a certain mounting impatience I felt near the end (with Alec, in particular) with what seemed to me to be an overly zealous (at times hurtful) pursuit of misconception. This dovetailed somewhat with the difficulty I had believing how quickly he changes gears. But then I reminded myself of the relatively short time period the story covers. And by the time myself accepted the reminder, I had moved on to the quite lovely conclusion, in which Alec (like myself) sees and remembers not to forget Lily exactly as she is. Which is to say—splendid. Fiction Fare - "I found myself so enthralled with their story and it was an such a wonderful touch to add and provide interactions with some of the characters from the previous stories in this series!" The Girl with the Happily Ever Afters - "This author continues to impress me with just how talented she is and I can't wait to read more from the Scandal & Scoundrel series." And now for the giveaway! To celebrate today's release of A Scot in the Dark, Avon has kindly offered up a brand new copy to one lucky reader. This giveaway is open internationally and will run through Tuesday, September 6th. To enter, simply fill out the Rafflecopter. Good luck, and happy reading!